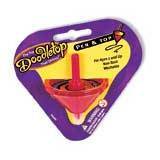 This pen is tops - it's a Doodletop: the spinning top that draws. Remove the cap and take Doodletop for a spin on a sheet of paper to create all sorts of unique designs. Try spinning it at an angle-wider angles will result in larger spiral designs. Slowly tilt the drawing surface while Doodletop spins for even more surprising and fun results.